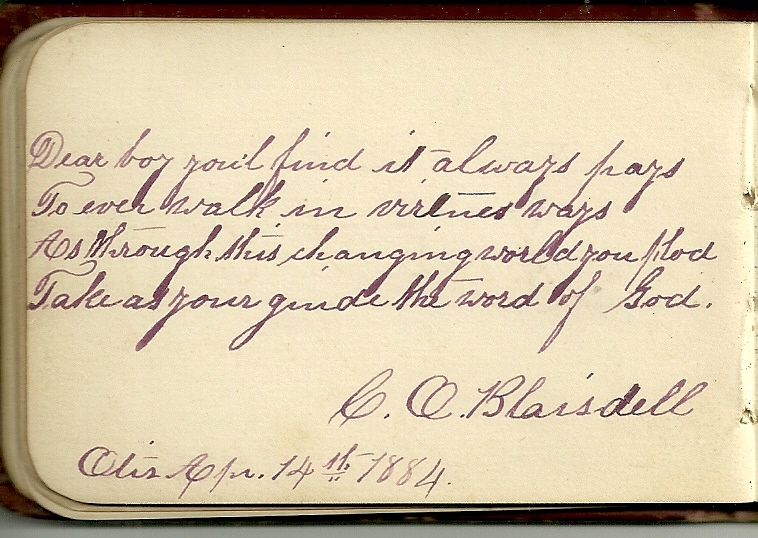 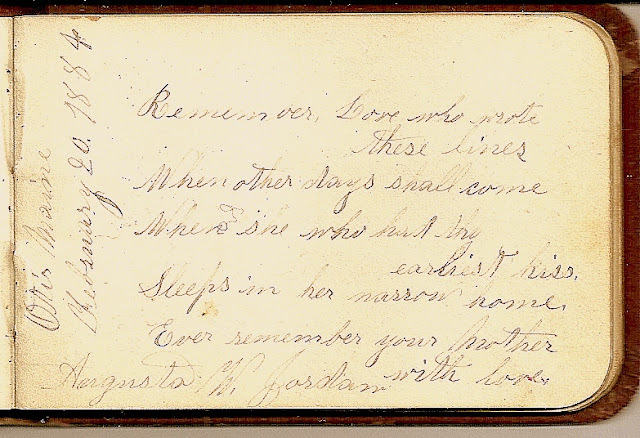 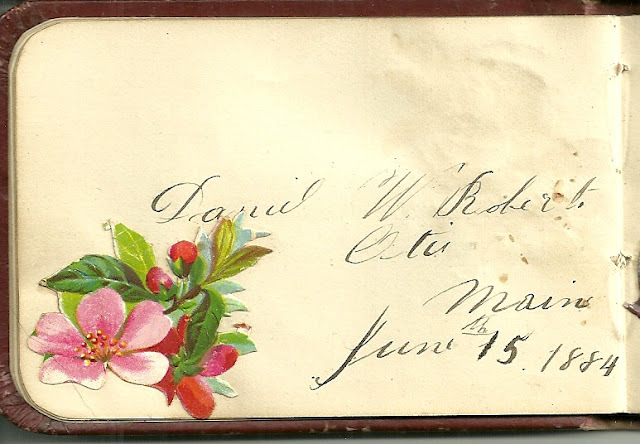 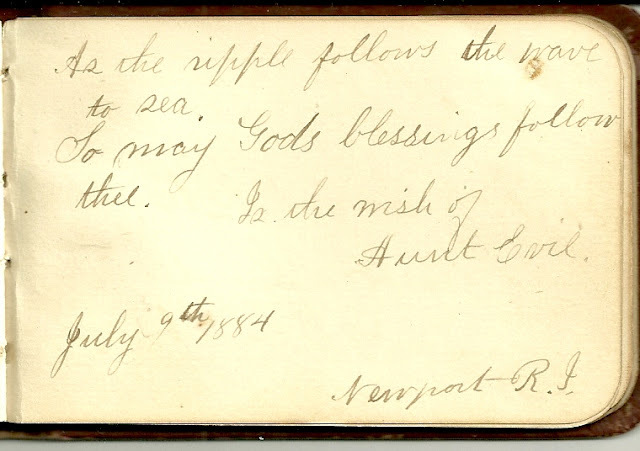 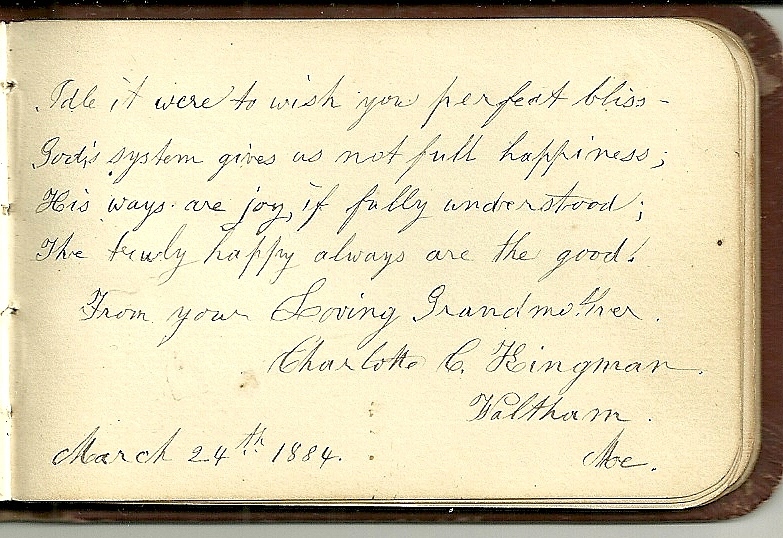 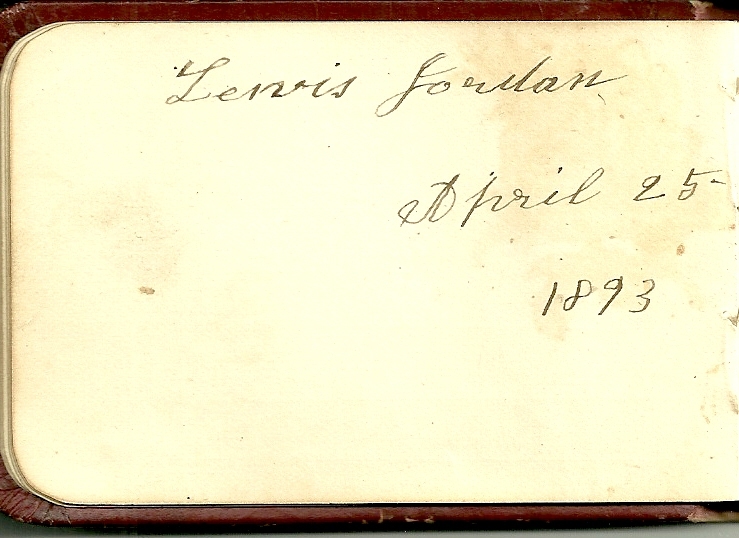 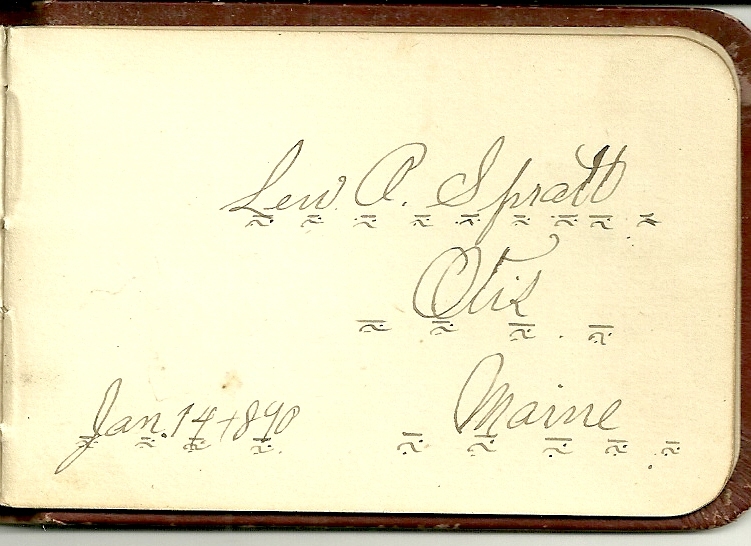 Small autograph album presented to Ora S. Jordan by his father at Otis, Maine, on Christmas Day in 1883. 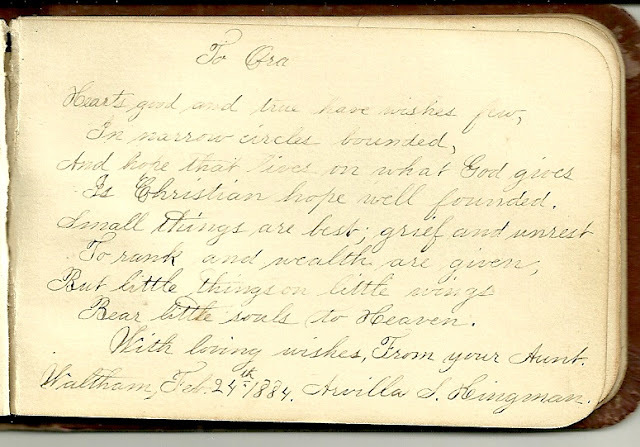 Ora was not yet two years old, having been born on 9 April 1882. 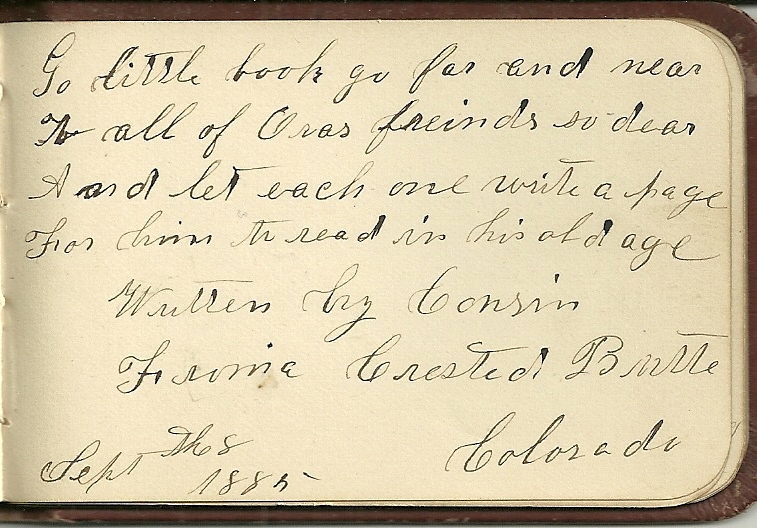 Apparently the intent was for relatives to sign his book for his future enjoyment. 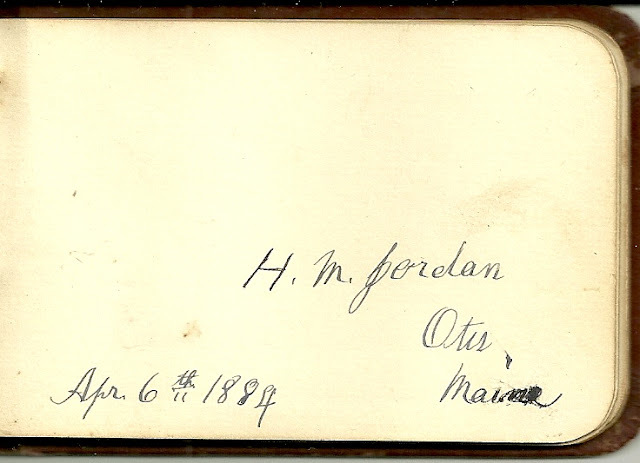 He was born in Maine, the son of Louis Stuart Jordan and wife Augusta Wood (Kingman) Jordan, born in Otis, Maine, and Hancock, Maine, respectively. 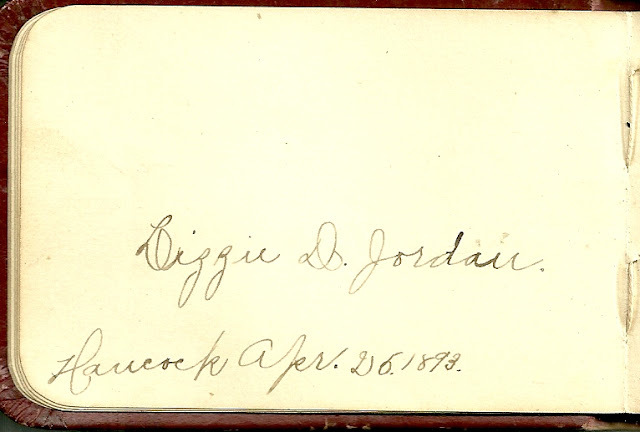 His paternal grandparents were Lewis and Abigail Gray (Blaisdell) Jordan. 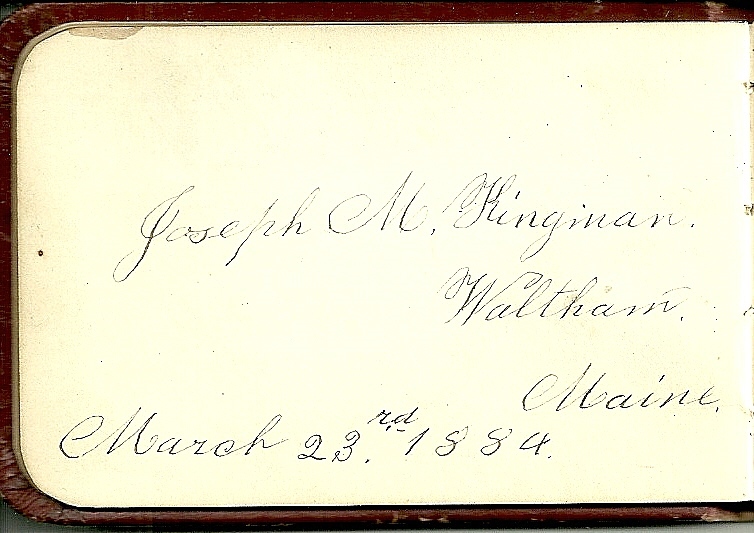 His maternal grandparents were Joseph Morrison Kingman and Charlotte Christiana (Colby) Kingman. 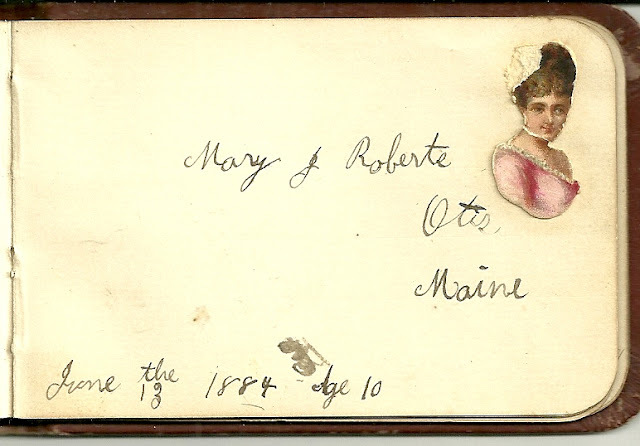 On 1 December 1911 at Ellsworth, Maine, Ora Spratt Jordan married Amy Belle Stratton, who was born about 1892 at Hancock, Maine, the daughter of Charles E. and Fannie Belle (Foss) Stratton. Her paternal grandparents were Elijah and Elizabeth (Mercer) Stratton. 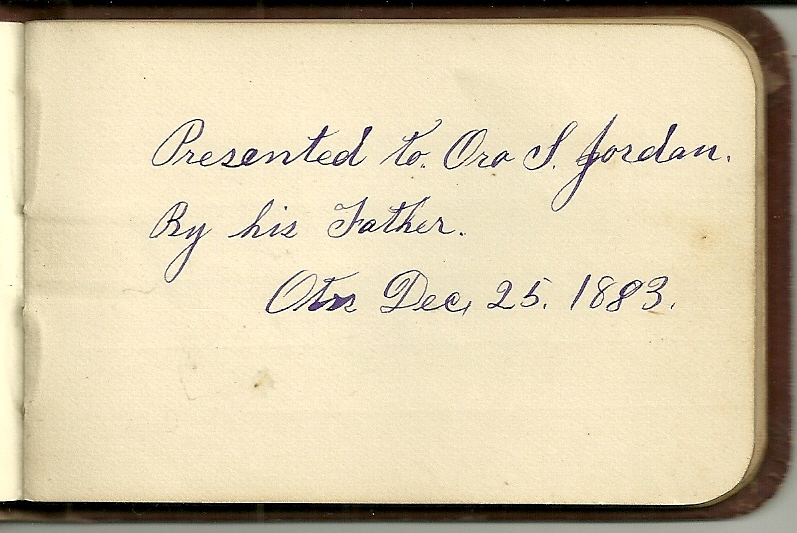 Her maternal grandparents were Edmond N. and Eliza Jane (Stratton) Foss. 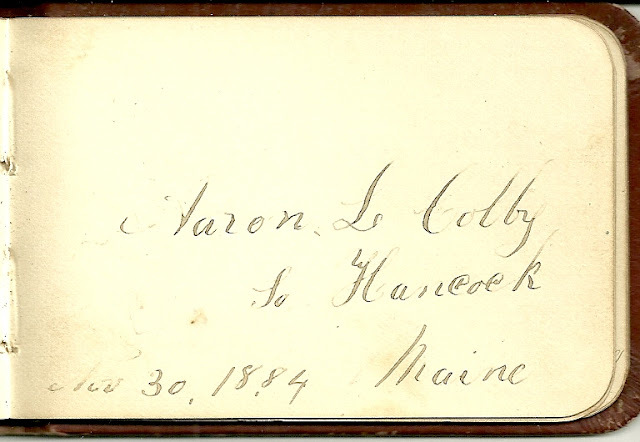 The couple made their home at Hancock, Maine. 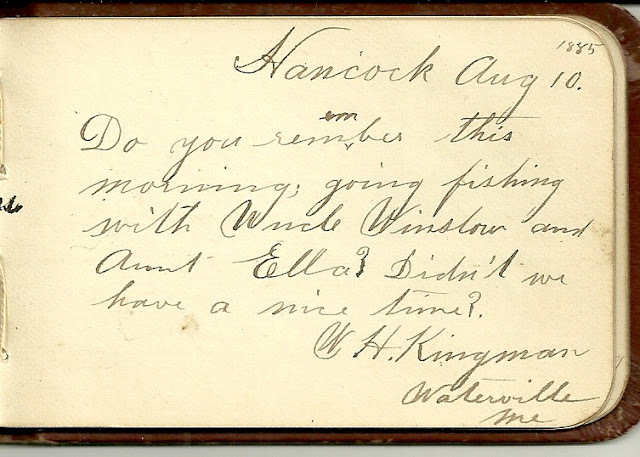 I didn't find any children living with them in the 1920 or 1930 Censuses of Hancock. The autograph book contained a small label with the name of Mrs. S. L. Jordan, Mt. 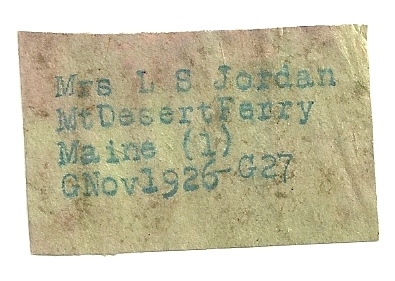 Desert Ferry, Maine, November 1926. 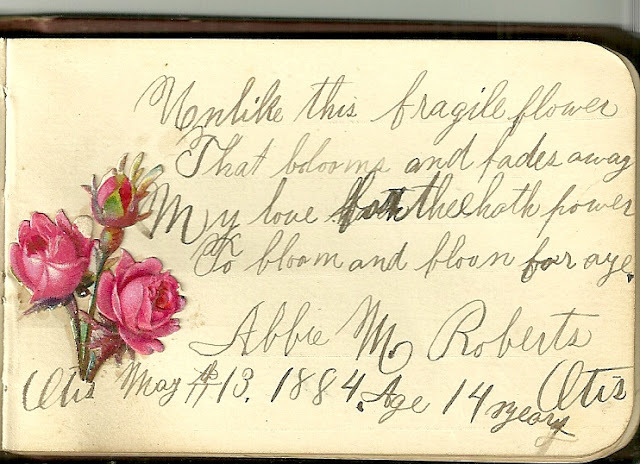 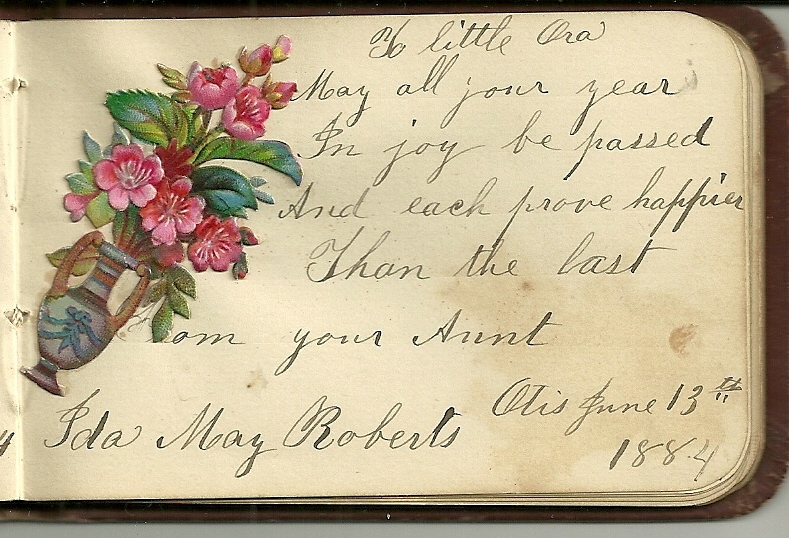 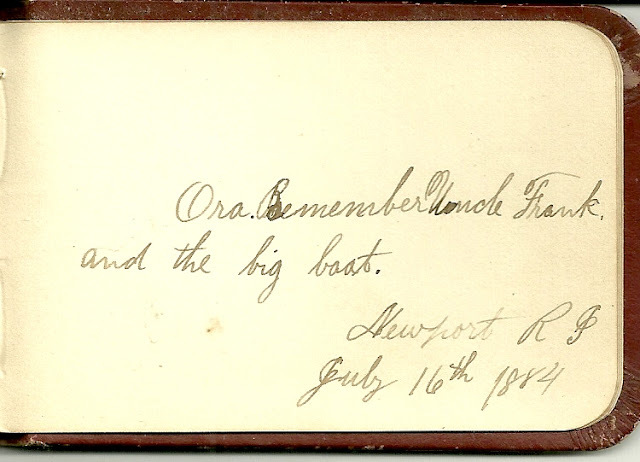 Also in the album are pages signed by three children of Daniel Webster Roberts and Ida May (Jordan) Roberts: Abby M, born about 1870; Charles F., born about 1872; Mary J., born about 1874. 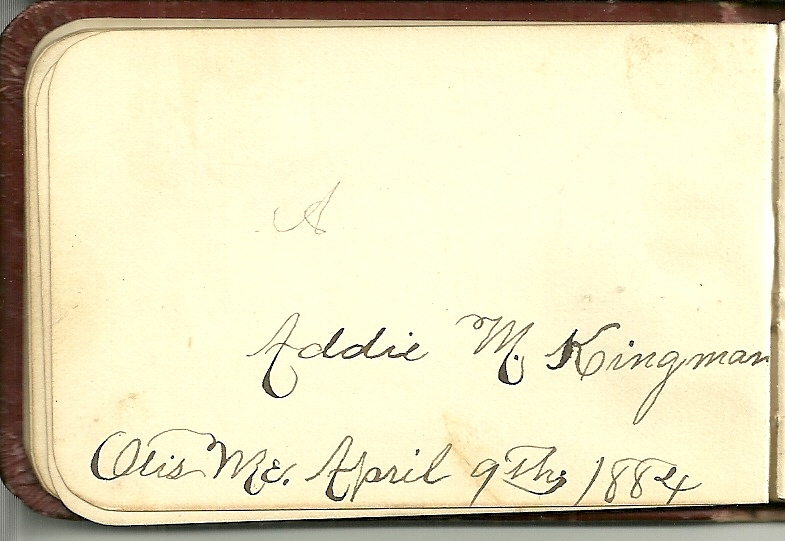 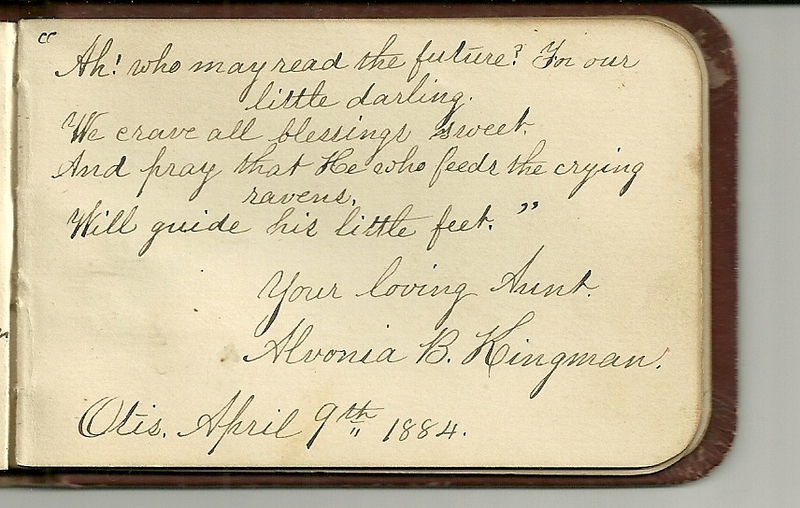 Farther along in the book are adjoining pages signed by Julia Evelyn (Tracy) Kingman's mother and brother. 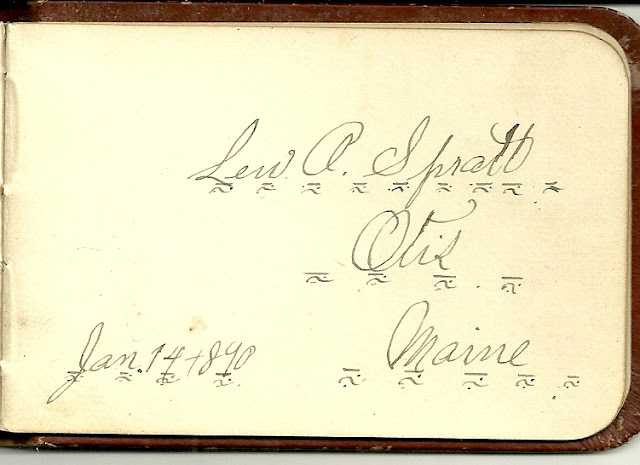 I believe the C. O. Blaisdell of Otis, Maine, whose page is below, is Charles Osgood Blaisdell, brother of Ora's paternal grandmother, Abigail Gray (Blaisdell) Jordan. 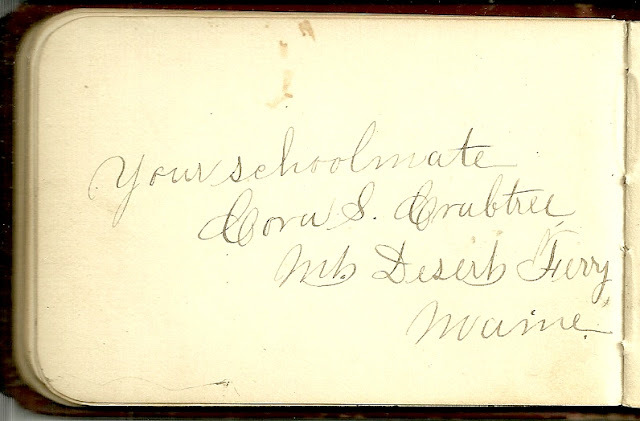 Charles Osgood Blaisdell, born 15 December 1832 in Dedham, Maine, married Martha Levitt Warren and raised a large family. 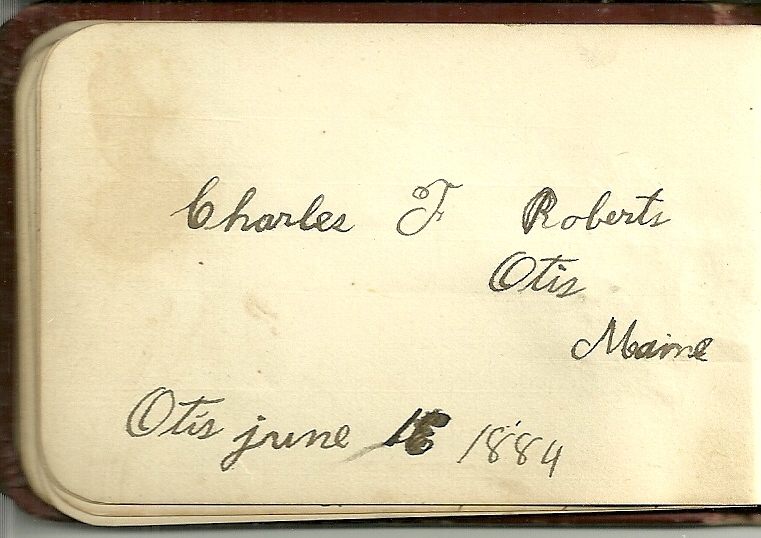 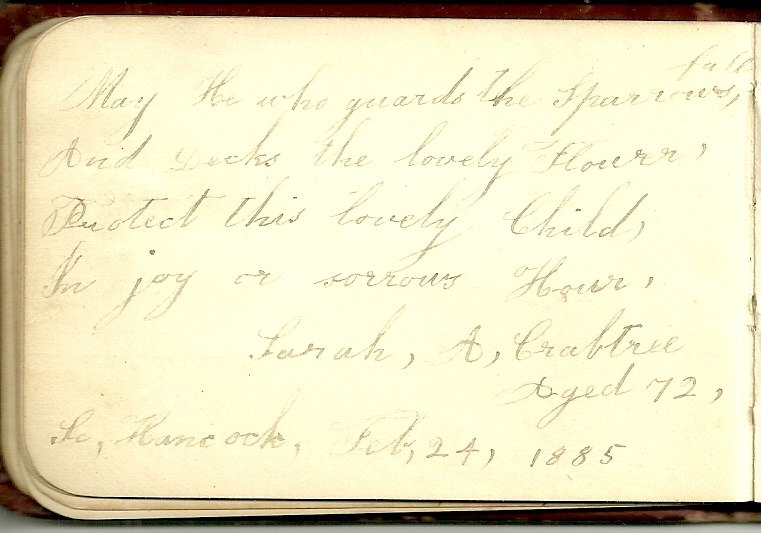 The signed page below is that of Aaron Luther Colby, born 30 September 1830, brother of Ora's maternal grandmother Charlotte Christiana (Colby) Kingman. 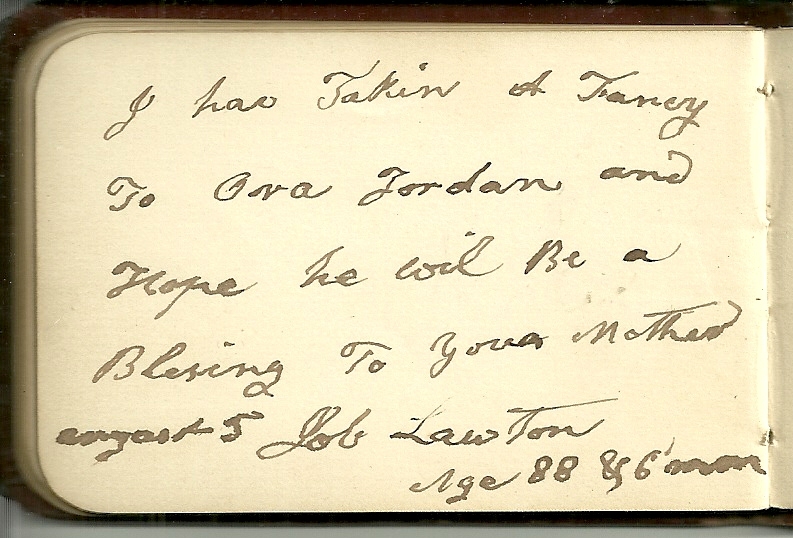 Aaron married Pauline Smith and raised a large family. Edmund Harvey Colby, another brother of Charlotte Christiana (Colby) Kingman, and his wife Elvira J. (Cushman) Colby, possibly a Saint John, New Brunswick native born about October 1848, signed adjoining pages. They married in Tuolume County, California, in 1863. [Sounds like an interesting story]. 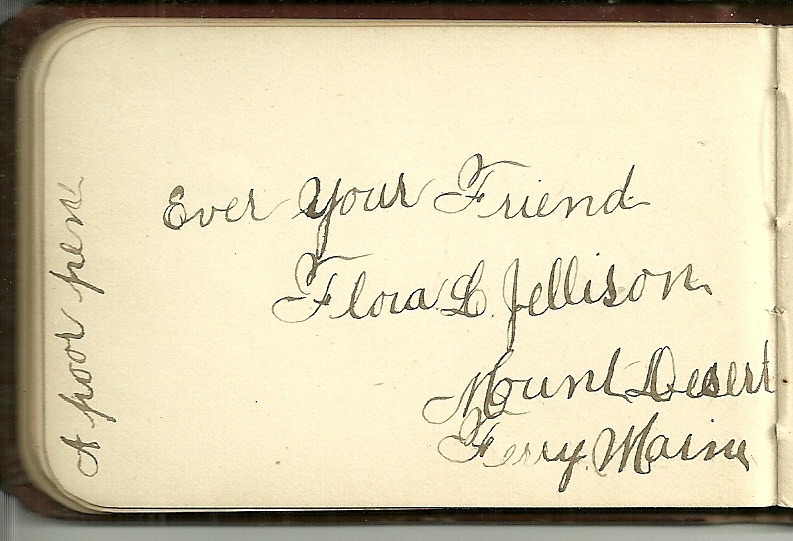 I had to enhance Elvira's faint handwriting. 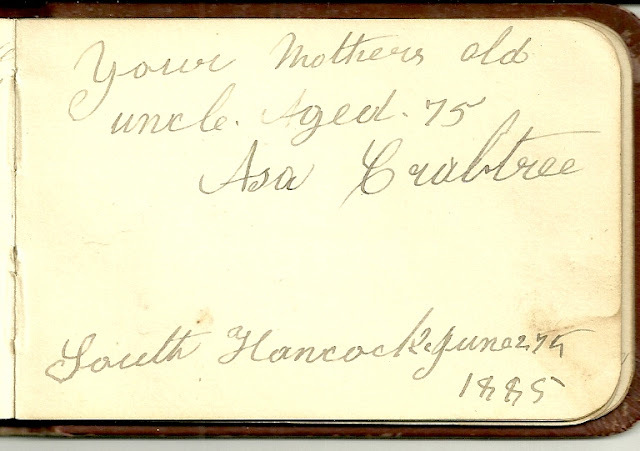 Asa and Sarah Crabtree signed adjoining pages. Sarah (Colby) Crabtree was a sister to Charlotte Christiana (Colby) Kingman, Ora's maternal grandmother. 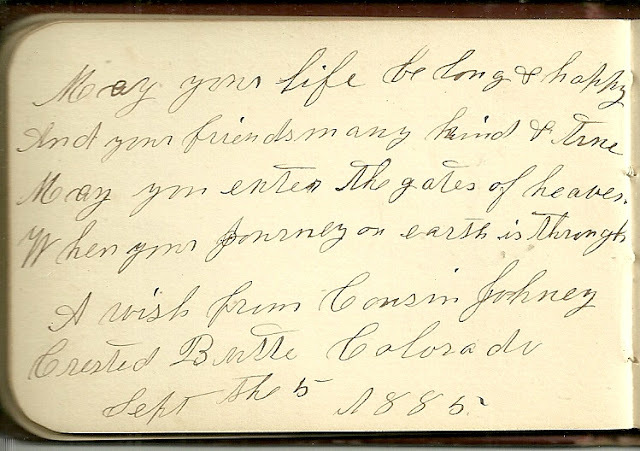 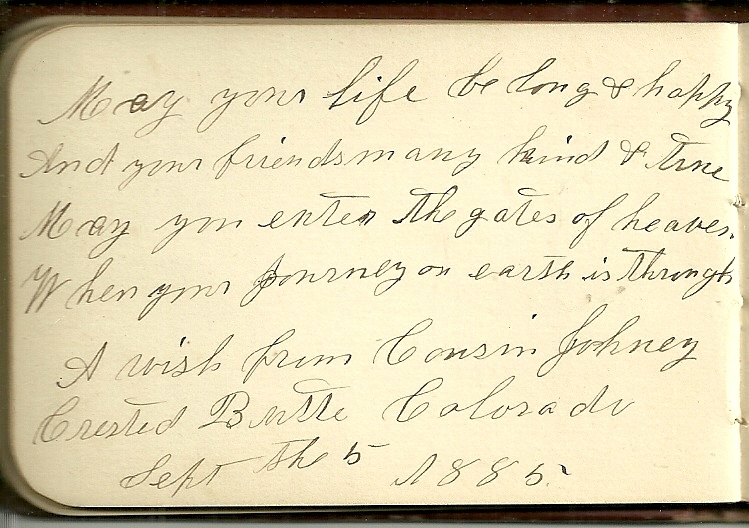 Signing adjoining pages in 1885 were Cousins Johney and "Fronia" from Crested Butte, Colorado. There was a Sophronia Colby, born in 1851 whose father Samuel Alexander Colby, older brother of Ora's maternal grandmother Charlotte Christiana (Colby) Kingman lived at Crested Butte, Colorado, at one time. This Sophronia married George B. 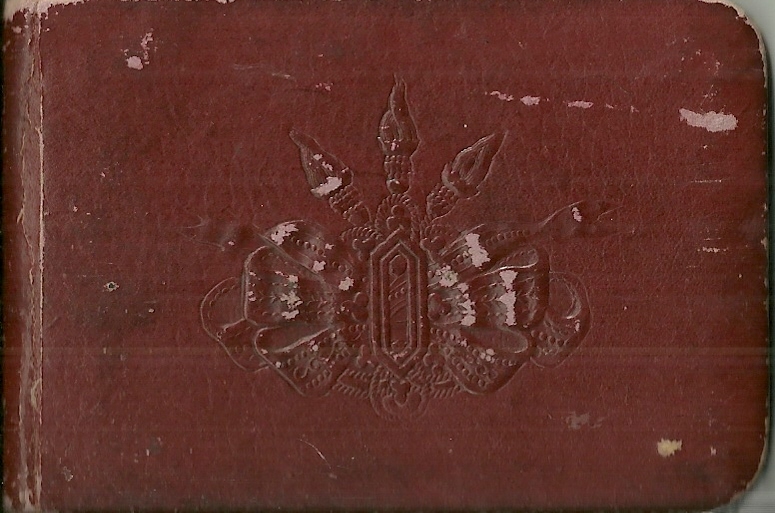 Gross in 1869. 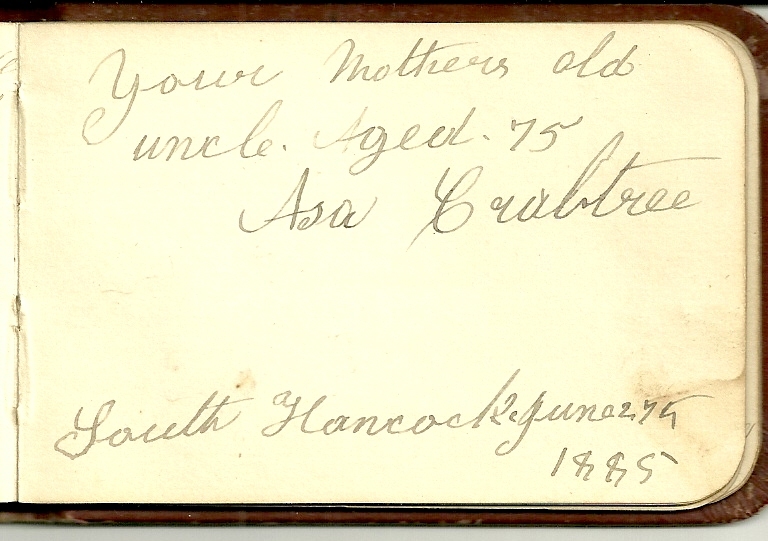 Whether she is the Fronia who signed the page below, or it was her namesake from a succeeding generation, I don't know. 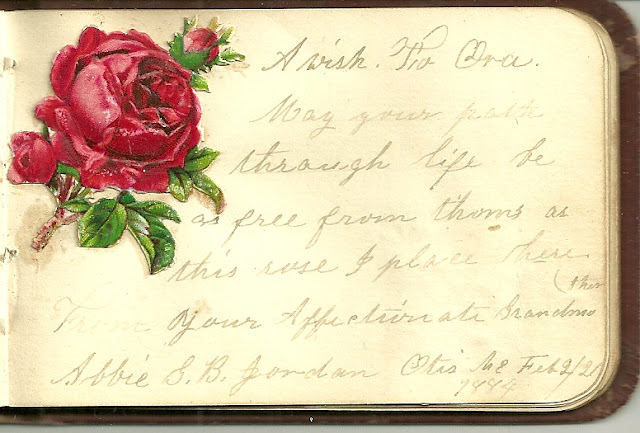 Perhaps a reader can clear up the mystery of Ora's cousins Fronia and Johney. 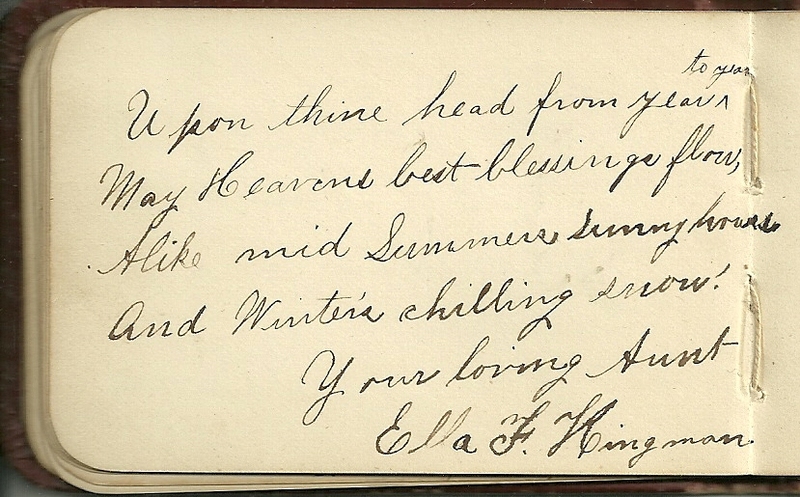 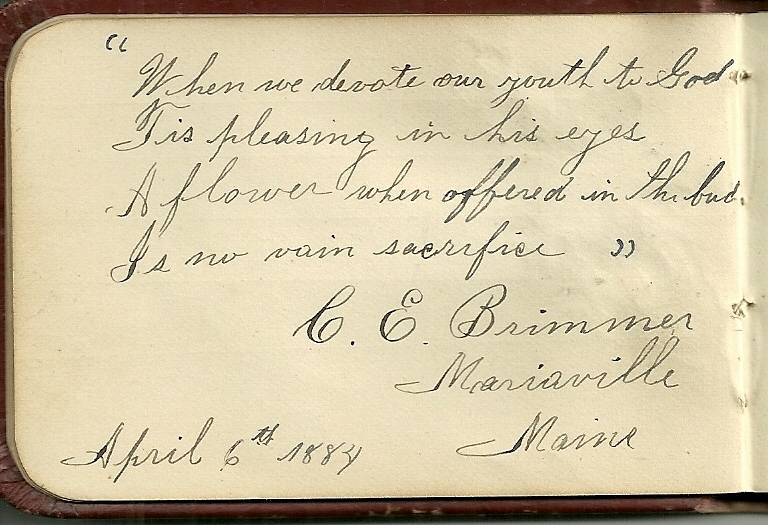 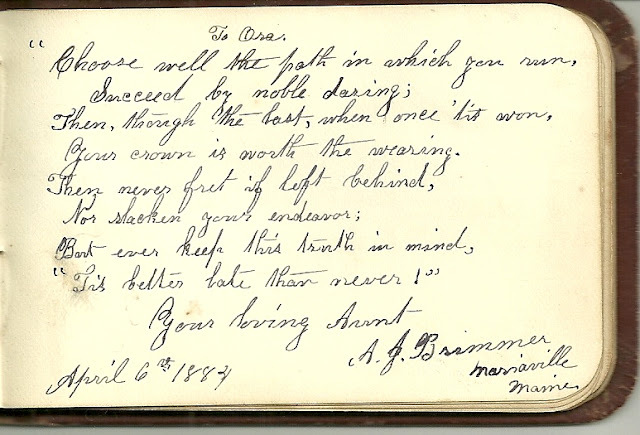 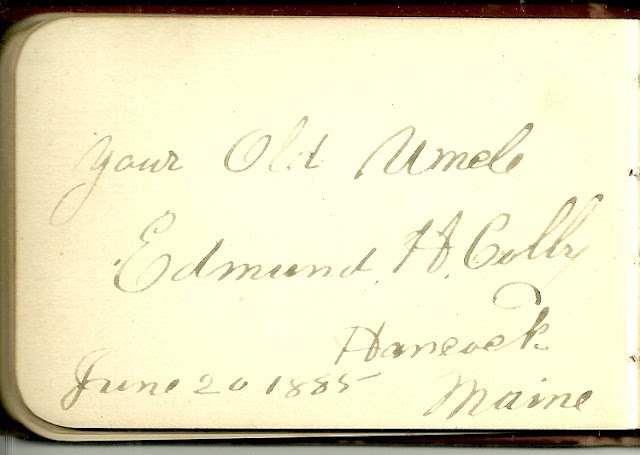 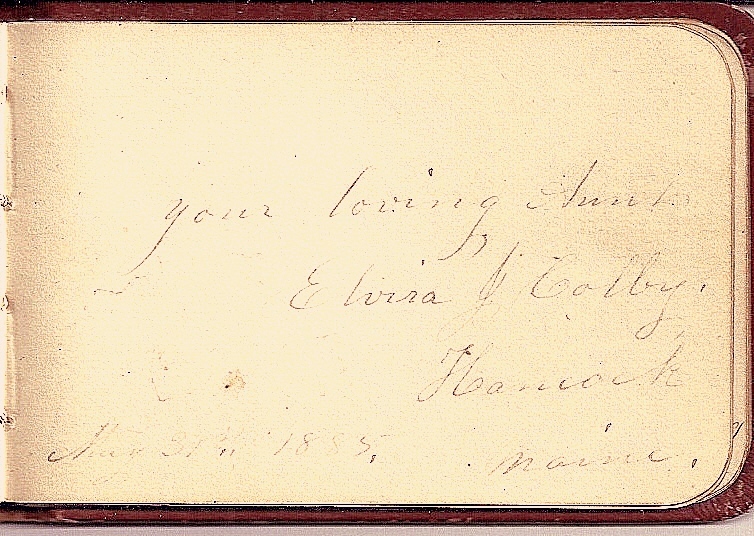 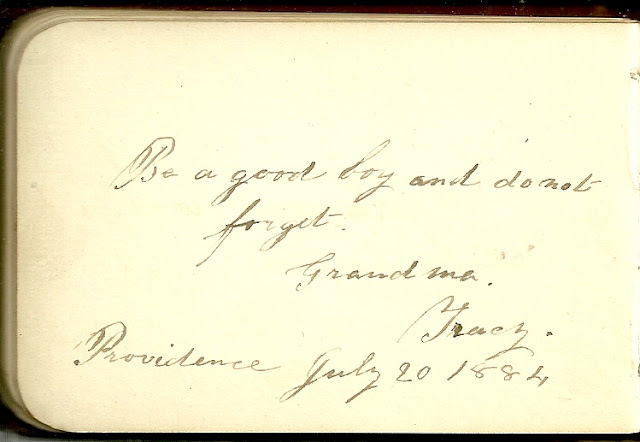 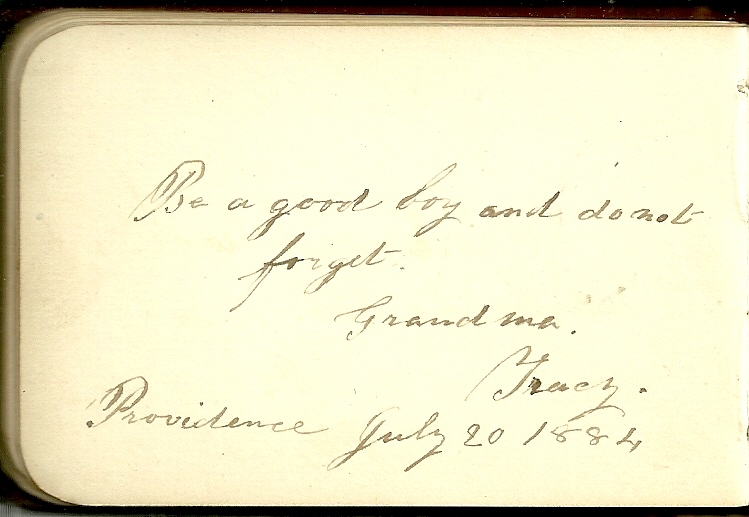 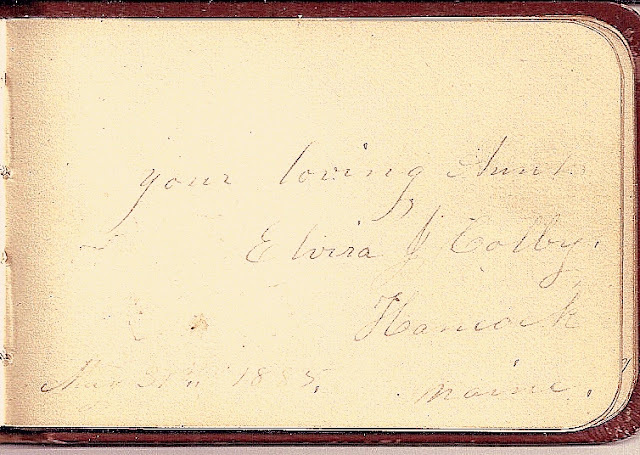 Adjoining pages in the autograph book are signed by C. E. Brimmer and wife A. J. Brimmer, who refers to herself as Ora's "loving Aunt". 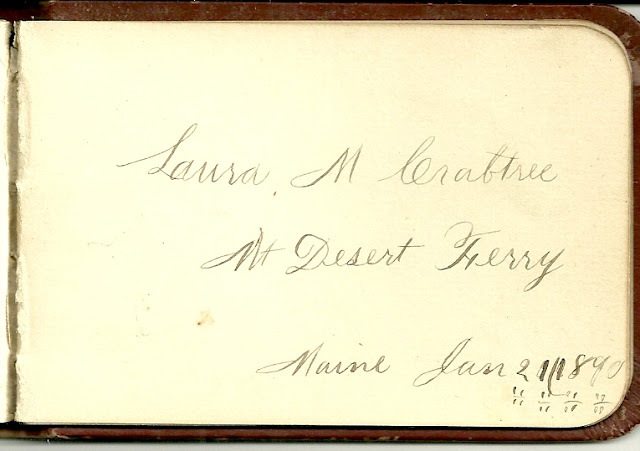 Pages signed by sisters Laura M. Crabtree and Cora S. Crabtree of Mt. Desert Ferry, Hancock, Maine. More information on Ora Spratt Jordan and wife Amy Belle (Stratton) Jordan. oh how wonderful! Love it! 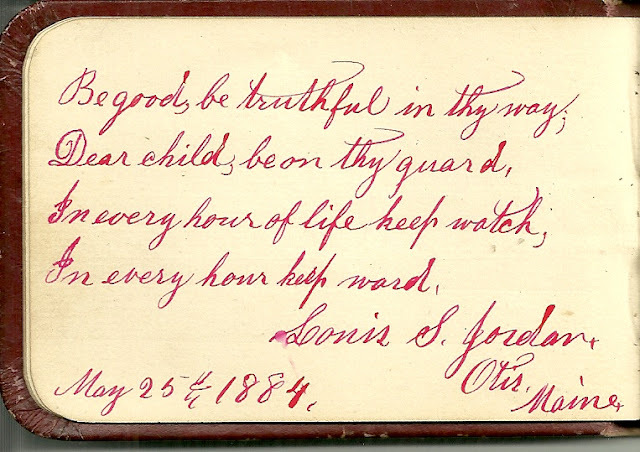 Wasn't it a neat idea to give him this autograph book when he was barely over a year old, when many of his older relatives were still alive and able to sign a page in it! 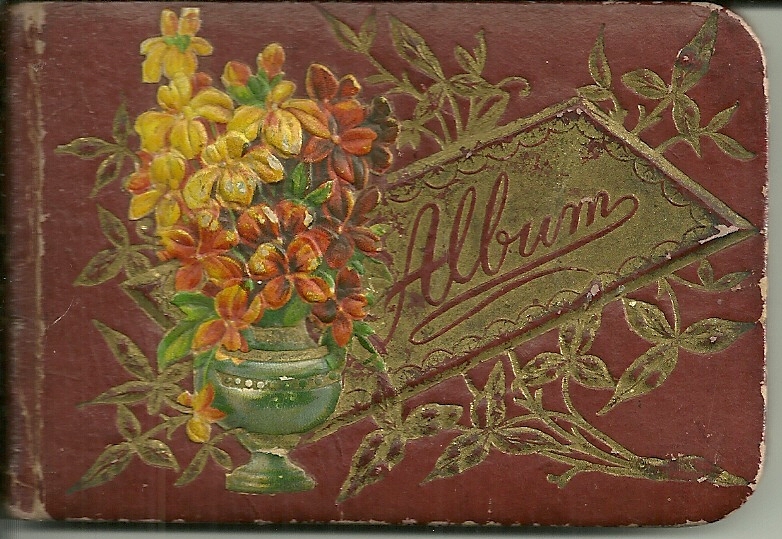 Do you still have this? 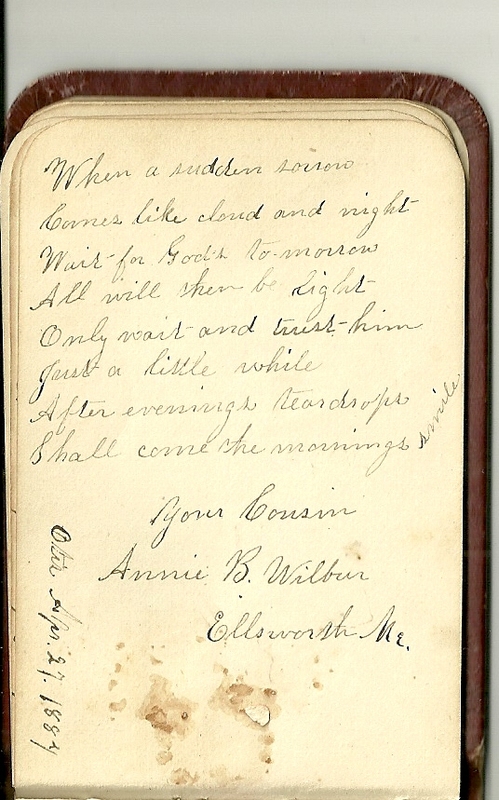 Annie Wilbur was my mother's relative. I think I can find the direct descendants who would treasure this. 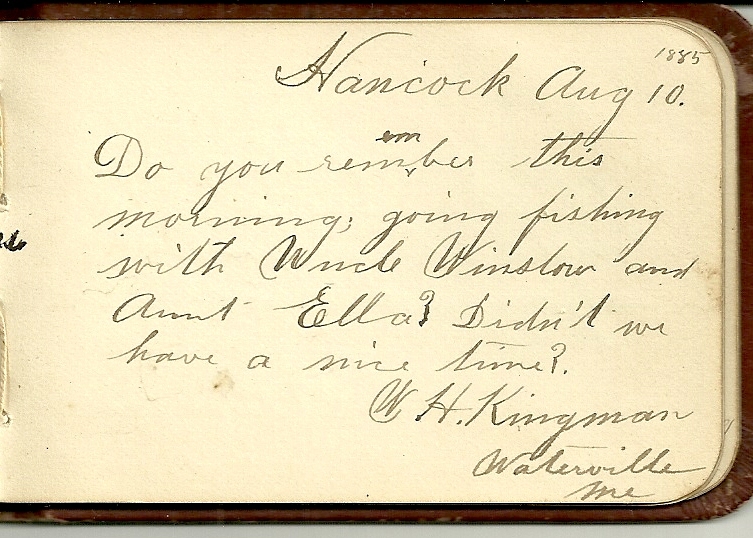 Got your email and will get back to you.